Ever wished you could find a music stand that’s strong, quiet, easy to use and economical, too? 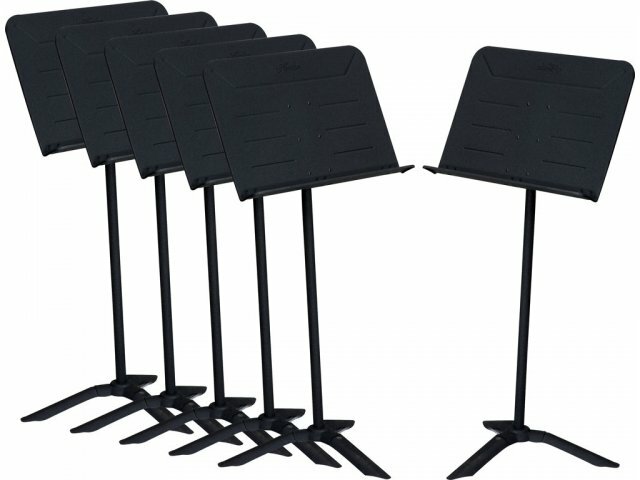 This 6–Pack of Music Stands from Midwest is just what you’re looking for. It features a precision clutch mechanism for quiet telescoping movement that holds it’ place and doesn’t collapse. It has a 19.75"W by 13.75"D desk that can hold up to eight pounds, allowing plenty of room and weight capacity for orchestral sheet music. 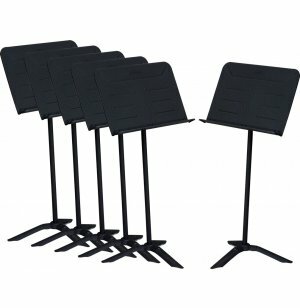 The 26–48.5" height adjustment makes this music stand suitable for a wide range of venues and users, and the black epoxy finish and chrome–plated telescoping tube give it a sleek, professional look. Available in an economical package of six, this music stand is the perfect choice for school bands, private studios, symphony orchestras and more. High–Quality Mechanism: Precision clutch mechanism provides telescoping movement that won’t collapse. Quiet Movement: Telescoping tube adjusts quietly, with no creaks or squeaks that disturb rehearsals or performances. Height Adjustable: Height adjustment range of 26–48.5 inches makes this music stand suitable for a wide range of venues and users. Durable Finish: Black epoxy finish with chrome–plated inner tube provides a sleek, professional look. Economical: This convenient 6–pack saves you money.